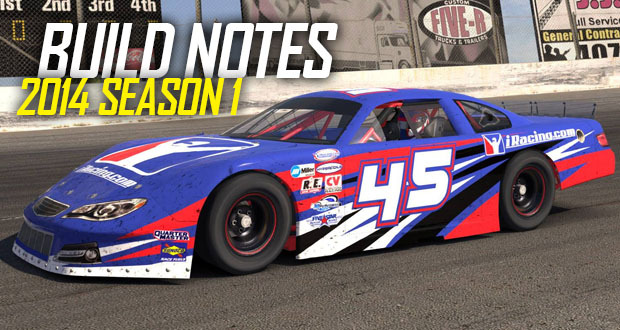 Dopo una lunga attesa, è finalmente disponibile la nuova 2014 Build Season 1 per iRacing, che inserisce in questa prima stagione dell'anno le nuove RUF RT 12R AWD e Super Late Model, entrambe dotate del nuovo modello fisico di pneumatici, denominato v5, che è stato inserito anche in altre 8 vetture, le più importanti delle quali sono sicuramente la Chevrolet Corvette C6R, Ford GT, Kia Optima e McLaren MP4-12C GT3; inoltre troviamo l'implementazione della regola Nascar denominata "Lucky Dog" e la sporcizia che si accumula sulle vetture, effetto grafico che da un pizzico di realismo in più al simulatore americano. Per l'elenco completo delle migliorie e degli aggiornamenti che la build apporta, vi rimandiamo al TOPIC DEL FORUM. "The new build is here, and with it come the Super Late Model, the final version(s) of the RUF and a host of new features including the Lucky Dog and an automatic setup loading function. The 550 horsepower Super Late Model is one of the baaadest stock cars to be found on any race track, virtual or otherwise. Those of you who enjoyed the preview of the RUF will be happy to know the build includes the finished car in all four versions . . . and if you didn’t preview the RUF, what are you waiting for? Among the new features are the Lucky Dog, which allows the “lead” lapped car to get its lap back during a caution period, and an auto load function that automatically chooses an appropriate setup for any given track. And in our never-ending efforts to “make it real,” cars will now accumulate dirt and grime over the course of a race, while improved texture maps will give a more three dimensional look to the trackside crowds and spectators in the grandstands."